You know how when you meet a person for the first time, you get vibes from them? 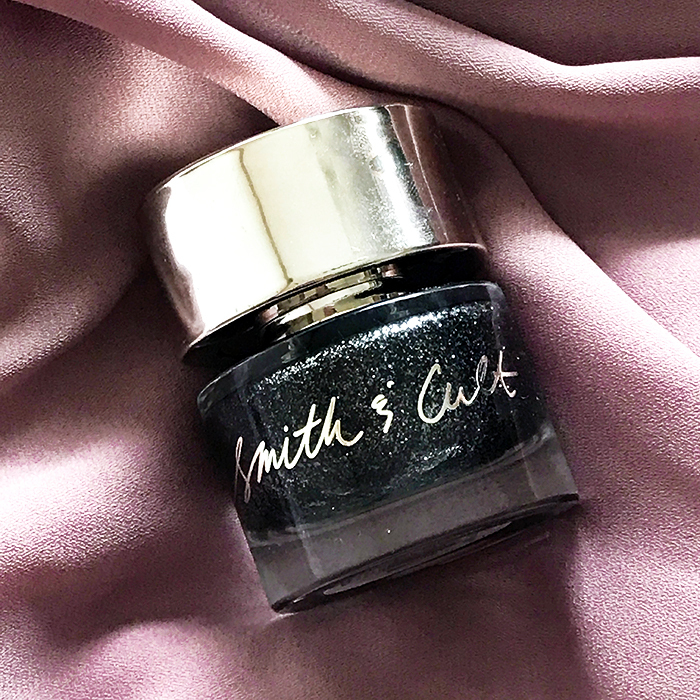 That actually happened to us when we laid our eyes on the Smith & Cult Nail Lacquer in ‘Dirty Baby’! The product exuded fierceness and confidence, so of course, we had to try it out. Here is our review. What attracted us to the lacquer first, was the luxurious packaging. The polish comes in a weighted, glass bottle and features the brand name in elegant lettering. The hammered, gold top is edgy, yet sophisticated, and balances out the round bottle perfectly. The top actually comes off to reveal a plain, black cap that holds the brush. The brush itself is shorter and wider than most but works well to distribute the formula evenly across nails. The exact shade name is mentioned on a sticker beneath the bottle. On the formula front, this lacquer was an absolute delight. Although this shade has glitter particles in it, the formula went on smoothly, without any patchiness or grit. ‘Dirty Baby’ is a black base with micro-flecks of silver glitter in it. To get complete opacity, we recommend applying at least 2 coats. Even though we know that glitter polishes usually last longer, we were taken aback at the staying power of this one! The colour stayed rich and sparkly, for over 2 weeks, without chipping or flaking. In fact, we only took off the shade because our nails grew out! Long lasting, intense and chic, this shade has rapidly made its way into our list of favourites. We can’t wait to try out more from the brand!